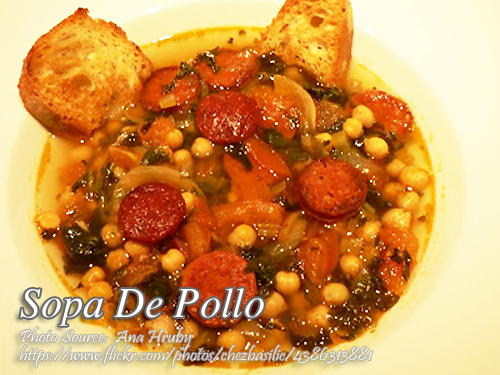 A simple Spanish chicken soup recipe that you can cook anytime. It’s so simple that you only have to saute the chicken innards such as giblets, heart, liver and blood then bring it to a boil until the chicken innards are cooked. Then add the vegetables and garnishing. To cook sopa de pollo: Sauté garlic, ham, onion, giblets, liver, heart and blood. Cook until the giblets are tender. Add chicken stock. Bring to a boil. Add peas and season with salt and pepper. Garnish with egg. Serve with croutons. soy sauce is salty i don’t like it neither sugar which is sweet. i like food that is healthy to eat because of my age.